The DMD4059 accepts an input from full Wheatstone strain bridge sensors, pressure transducers or load cells. It provides filtering, amplifies, and converts the millivolt input signal into the selected dc voltage or current output that is linear to the input. The 3-way 1200V isolation eliminates ground loops, common mode voltages and greatly reduces noise pick-up. Sense wire connections are available to give maximum accuracy. 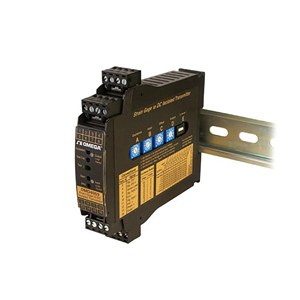 Input, output, excitation and zero offset are field configurable via external rotary and slide switches. Offsets of up to ±100% of span can be used to cancel sensor offsets or tare fixed loads. Features such as red and green LEDs vary in intensity to show input and output activity and an output test button helps with set-up and troubleshooting. Compliance, Drive @ 20 mA: 20V, 1000&937; drive; current output can be selectively wired for sink or source. Function Test Button: Sets output to test level when pressed. Adjustable 0 to 100% of span via potentiometer. Factory default is approx 50% of span.